Please Note: Non-Manufacturing Members Must Provide 5 Referrals of Clients in a Manufacturing Related Field No Later Than 30 Days After Signing Up for Membership. Submissions can be sent to support@georgiamanufacturing.com. Company whose employee count is 1 - 100. $500 per year for company membership at the Associate 1-100 level. Company whose employee count is 101 - 249. $750 per year for company membership at the Associate 101-249 level. Company whose employee count is 250 - 499. $1000 per year for company membership at the Associate 250 - 499 level. Company whose employee count is 500 or more. $1500 per year for company membership at the Associate 500 plus level. 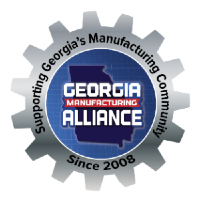 Special price for NEW GMA manufacturing members who host a plant tour for the Georgia Manufacturing Alliance. The tour MUST BE approved by the Georgia Manufacturing Alliance staff PRIOR to purchasing this membership. Please contact support@georgiamanufacturing.com or 770-338-0051 for more details and to see if your facility qualifies. This rate is for the initial year only. Full member benefits are provided. $250 for the first year membership dues.